The 100 percent smoke-free and pet-friendly Comfort Suites hotel in Hayward, WI lets you rest and get ready to take on the day. 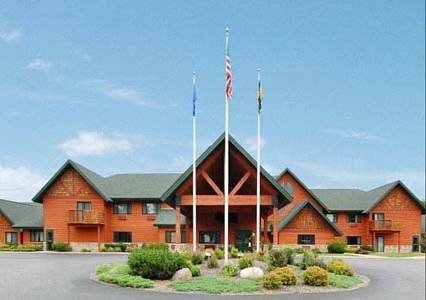 Our lakeside location on Lake Hayward gives you easy access to Chequamegon National Forest, Scheer Lumberjack shows, CAMBA Bicycle Trails and LCO Casino. Amenities include free WiFi, free parking, free hot breakfast, fitness center and an indoor heated pool. Behind every great day is a great night in your suite, which gives you 25 percent more of the space that you need and features a refrigerator, microwave and coffee maker. Also, earn rewards including free nights and gift cards with our Choice Privileges Rewards program. USD15/pet/night, limit of 2 pets/room. This remote ball of baler twine is, by some measures, the biggest in the world. It's certainly the heaviest (approaching 23,000 pounds). A solo backyard project. If you like to look at old trains, this museum claims to have the largest collection of them in the Midwest.